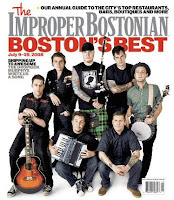 The annual "Best of Boston" issue put out by the Improper Bostonian is now out on newstands. I picked up my copy today and leafed through it on my long, long plane ride to CA. Even if you don't agree that their choice is the "best" most of their choices are up there around the top. It's like having a very well-versed friend give you suggestions on things to try out. I pick up my issue each year and end up holding on to it for at least six months before I throw it away. A few places that I've been meaning to go to but haven't yet: Hammersley's Bistro; Craigie Street Bistrot, and Zaftigs. All three of them were amongst the "best of." There's also a bunch of other categories like shopping, salons, and spas - that I usually leave untouched. 1 Response to "Improper Bostonian - Best of Boston 2008"
CHILLI GUY NAMES BEST HOMELESS MAN!